Massage balls will change your life! Its like having your own private physio on hand to work into any pressure points or knots. The best bit? You can control the pressure yourself. Much like a roller, these guys work into the tissues that connect your muscles, ligaments and bones together. With their uniquely small size you will be able to get deeper into your target area than just about any other self-massage tool. The trick is knowing where to stick em. Here are my favourite 6 ways to use my Balls. I meet so many people complaining of lower back pain, most of the time its just all of those little muscles being too tight. This is my go to quick fix if I ever spend too long on my feet! You want to start around the tops of your bum muscles, feet flat to the floor to help with the pressure. As you slowly explore the area move the balls closer in towards the spine. 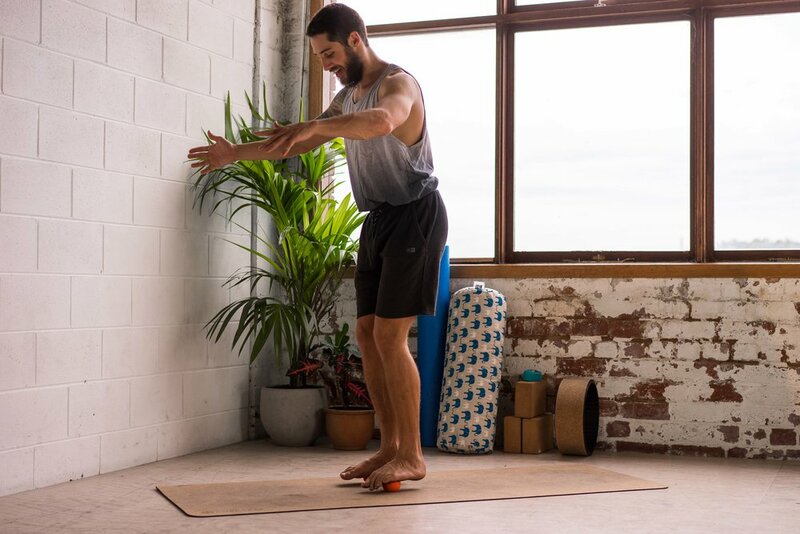 When you find a really good spot, see if you can slowly take your feet off the ground and draw your knees into your chest, this is going to give you maximum release! As soon as we get stressed, the first thing most of us tend to do is tense up through our upper back and shoulders. It’s one of the worst feelings in the world, your neck seizes up because of it, maybe you can’t look over your shoulder suddenly, maybe your massage therapist isn’t available for a couple of days. Welcome to instant relief. Start moving the balls up either side of your spine from your lower back, again you can control the pressure with your feet or bring your legs in to your chest. Once you’re happy flip the arm over to massage out the bottom side. If you’re not getting enough out of it you can stack both arms on top of each other for some extra pressure. Sooo many people have tight hips, why? Because most of us are constantly sitting. The more you immobilise your hips, the tighter they get. I like to start off laying one side and placing the ball directly underneath my hip bone. From here you can start to slowly roll into the top of your glute by turning your back towards the ground. If you do a sport that is legs intensive like running or skating this is going to be PAINFUL, but don’t worry, it’ll soften up eventually! This one is so much fun! Our feet literally take the weight of our entire body, give those little guys some love every now and then without having to ask for foot massages. You can start with just one foot, then move to balancing on the balls with both feet. Both feet at the same time can also double as a party trick….